This summer I was conducting research in the Chest Clinic and Fevers Unit at the Korle Bu Teaching Hospital in Accra, Ghana with a medical student and two other undergraduates from Brown University. My research project was a retrospective literature review that was trying to identify how HIV and tuberculosis interact and affect the outcomes of co-infected patients. While there, I was lucky enough to have the opportunity to explore the vast array of ethnobotanical knowledge that exists in Ghana. Below is a brief summary of one of my experiences collecting medicinal plants in rural Eastern Ghana. Located on the Eastern most side of Ghana bordering Togo, the interior Volta region is the epitome of what one thinks of when you hear the word “rural.” With its rich vegetation, lush forest and sprawling mountain ranges it’s really no surprise that I found myself here more than once while in Ghana. After visiting the small village of Liati Wote once before on a (successful) quest to climb the tallest mountain in Ghana, Mt. Afadjato, and see the highest waterfall in West Africa, Wli Falls, I knew that that excursion wouldn’t be my last visitation to the East of Ghana. When climbing Mt. Afadjato our trek guide, Godsway, and I chatted often as we approached the summit. I told him about my interest in medicinal plants, ethnobotany, rural medicine and Traditional African Medicine (TAM). Luckily for me, he was very interested and willing to help me learn more about the medicinal plants used in Eastern Ghana. Since I was only there for a day at that time, I collected his contact information and scheduled a date in which I would return. He told me that when I came back, he would show me a lot of the medicinal plants used and have a friend, Kwame, whose father was a medicine man in the village accompany our plant collection. Success! After following up with Godsway, we planned my return trip and plant collection journey. Flashing forward two few weeks, I returned during my last week in Ghana to Liati Wote and Mt. Afadjato to see my friend Godsway and collect medicinal plants. With minimal collection gear available to me at the time, I had to fashion a make-shift plant press from the cardboard of an old microwave box and a few straps I found. Newspaper, plant press, garden pruner, Leatherman pocketknife and notebook in hand, I was ready to go! While this wasn’t my first time doing field work, I think that this experience was definitely my most memorable ethnobotanical experience. 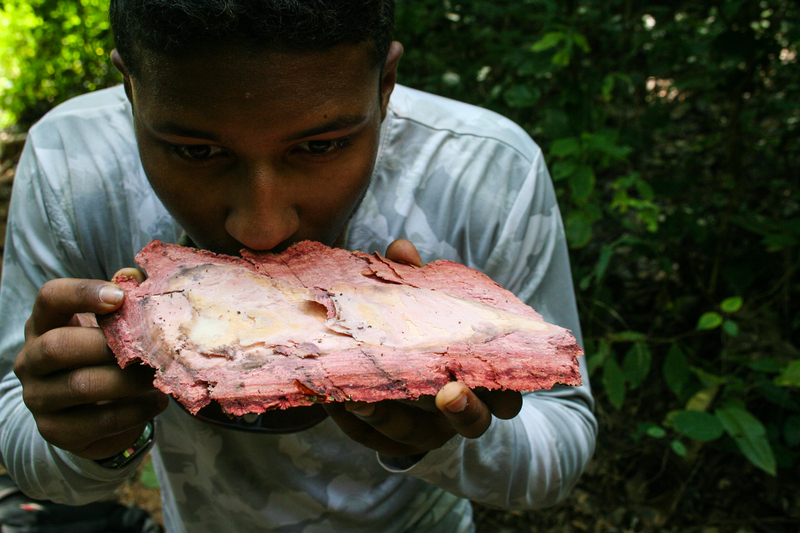 Being able to taste the bitterness, smell the aromas and feel the textures of the plants is one thing that I will never forget, and I think that having the ability to truly experience the field, the plants and the earth with all of my senses in such a natural environment was extremely rewarding. After a long day of collecting, Godsway, Kwame and I said our goodbyes for the evening. I made sure to thank them for the incredibly valuable experience that they provided me with. I gave them each a token of my appreciation and headed to bed with a plant press full of specimens. The next morning, I woke up early to try to catch the bus back to my hostel in Accra. I met with Godsway to discuss my options for getting back to Accra. Not surprisingly, he informed me that the village was so small that no taxis were available to take me from the village back to the main highway – a 40 mile trek. Lucky for me, he had a friend who was willing to take me back to the highway on his motorbike. So, with gear and plants in hand, I said goodbye to my new friends Godsway and Kwame, and began my hour ride back to the highway. Now that I’ve come back home to the U.S., I’ve had time to reflect upon this and the other ethnobotanical experiences I had while in Ghana. Experiences like these are what really invigorate me about the field of ethnobotany. The ability to go out into the field, learn, collect and connect with a culture and place so different from my own has afforded me a truly life-changing perspective, and I hope to share that perspective with others and one day influence others to gain a similar experience. Moving forward, I hope to begin my thesis research in Central America this summer doing more field and lab work. But until then, and even after that, I will remember these experience in Ghana as – what the title suggest – the most satisfying taste of the future.